Rani Roopmati, was a Hindu singer, and later Queen of Malwa after her marriage to Sultan Baz Bahadur. 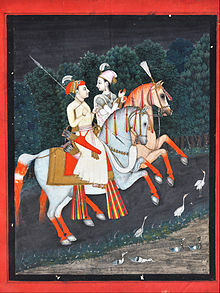 The Sultan and Roopmati fell in love with each other and were married according to Muslim and Hindu rites. Adham Khan was prompted to conquer Mandu partly due to Roopmati's beauty. When Adham Khan marched on the fort Baz Bahadur met him with his small force and was defeated, Roopmati poisoned herself. Thus ending the magical love story which was steeped in music, poetry, romance, war and death. This romance is considered a legend by some whilst others consider it to be true. Baz Bahadur, ever so fond of music, was the last independent ruler of Mandu. Once out hunting, Baz Bahadur chanced upon a shepherdess frolicking and singing with her friends. Smitten by both her enchanting beauty and her melodius voice, he begged Roopmati to accompany him to his capital. Roopmati agreed to go to Mandu on the condition that she would live in a palace within sight of her beloved and venerated river, Narmada. Thus was built the Rewa Kund at Mandu. The Defeat of Baz Bahadur of Malwa by the Mughal Troops, while Rani Roopmati, and her female companions, view the scene from the terrace of the fort. 1561- Akbarnama, ca 1590-1595 CE. Unfortunately, the romance of this Muslim prince and Hindu shepherdess was doomed to failure. The great Mughal Akbar decided to invade Mandu and capture Roopmati and Baz Bahadur. Akbar sent Adham Khan to capture Mandu and Baz bahadur went to challenge him with his small army. No match for the great Mughal army, Mandu fell easily. Baz Bahadur fled to Chittorgarh to seek help. As Adham Khan came to Mandu, he was surprised by the beauty of Roopmati. Rani Roopmati stoically poisoned herself to avoid capture, bringing an end to the love story. The Rewa Kund is a reservoir built by Baz Bahadur at Mandu, equipped with an aqueduct to supply Roopmati's palace with water. Today, the site is revered as a holy spot. Baz Bahadur's Palace was constructed in the early 16th century, and is notable for its spacious courtyard fringed with halls, and high terraces which give a terrific view of the lovely surroundings. Rani Roopmati's Pavilion was built as an army observation post. It served a more romantic purpose as Roopmati's retreat. From this picturesque pavilion perched on a hilltop, the queen could gaze at her paramour's palace, and also at the Narmada flowing by, below. Rani Rupmati's double pavilion perched on the southern embattlements afforded a beautiful view of the Narmada valley.